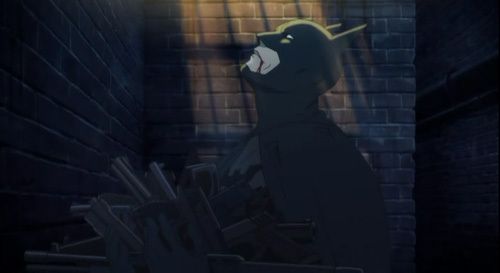 Designed to replicate the success of 2003’s The Animatrix, Batman: Gotham Knight is another anime anthology riding on the crest of a trendy movie franchise that seems destined, by virtue of Hollywood’s dollar, to be seen by many more people than your average Planetes or Gungrave. Like it or not, it’s exactly this kind of release, along with Afro Samurai and its ilk, that represents the image of Japanese animation to the eyes of the unwashed masses, and for good or for bad, tends to influence their many opinions. In this case, it’s definitely for bad. Batman: Gotham Knight isn’t a disaster, it’s just heartless, devoid of feeling and worst of all, boring. One fist-cracking action scene follows another and while most of them are beautifully animated, the stories themselves are merely adrenaline-fuelled and tiring. Studio 4C contributes the two most visually-arresting shorts, the first ‘Have I Got A Story For You‘ and the fifth ‘Working Through Pain‘. 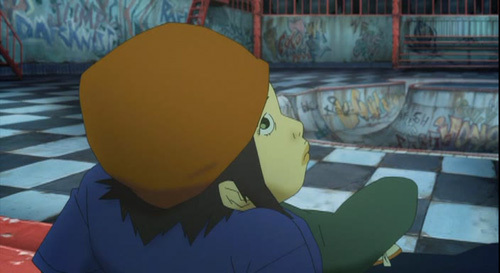 The former has a wonderfully fluid, urban-punk aesthetic which has clearly been traced from director Shojiro Nishimi‘s previous work, the sky-scraping and colourful Tekkonkinkreet. The latter, peppered with moody lighting and authentic landscape, dares to risk some character development in Bruce Wayne and, by its end, finds our hero lost in despair. The only other segment worth mentioning is the thoroughly grotesque ‘In Darkness Dwells‘ (animated by Madhouse and directed by Yasuhiro Aoki) because it looks so unconventional and strange, like a hybrid of Gurren Lagann‘s more extreme character design and the gritty cartoon adaptation of Spawn. All style and no substance just about sums it up then. 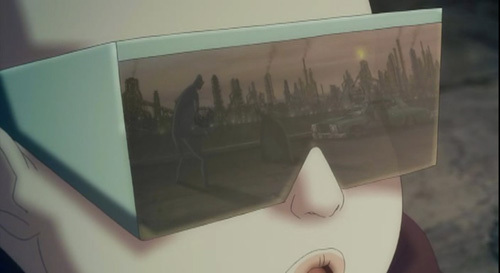 Though one could point to the meagre running-time of each short (around 10-12 minutes in length) to explain the lack of actual plot, anthology predecessor The Animatrix includes several episodes which are just as limited by time yet remain magnificent, not least of all ‘Beyond‘, ‘The Second Renaissance‘ and ‘Kid’s Story‘. The problem here is the lacklustre writing, which hardly dares stray from the half-baked villainy and cartoon dirge of Gotham City. The Animatrix‘s best effort was ‘Beyond‘, which it had nothing to do with Neo, Morpheus or Trinity, yet made the most of being animated, fun and limitless. I mean, with ‘She and Her Cat‘, Makoto Shinkai needed just 5 minutes to forge his entire career. Lack of time is not an excuse for poor storytelling. Aside from the above, my biggest issue with Batman: Gotham Knight is the stereotype it inevitably reinforces – that all anime is either Pokemon kids-fare or Ninja Scroll-level cartoon violence. What I really loved about The Animatrix is that, alongside the more typical action fluff, it shone with elements of slice of life and drama; it was a great showcase for the diversity of anime as a medium, not only in terms of visuals, but in terms of storytelling too. Gotham Knight is a throw-back to that era when anime wasn’t expected to be anything other than stupid, violent and extreme. It’s worth seeing for the Studio 4C segments, but The Animatrix this is not. Heh, well there you go. Personally I thought it was about the same quality as The Animatrix (worth a watch for the visuals and the odd story but hardly any rewatchability) although I was hoping that it would be closer to the style of the Nolan films since that’s what it was described as being, a bridge between Batman Begins and The Dark Knight. I felt kind of cheated in that respect. I don’t agree that it was totally heartless but like The Animatrix some segments were much better than others with ‘Working Through Pain’ and ‘Field Test’ being my favourites on this one. I probably shouldn’t judge something without seeing it but this seemed to me to be the type of production that is all about the style and not the substance. Then again I actually felt the same way about Animatrix so I was never really interested in this. But I agree with you that titles like this do lead to more stereotypes. For one thing I think too many non-anime fans think anime is all about the look and its “cool” factor. They don’t realize how many genres anime covers, how many target audiences it reaches and in fact there isn’t one style that defines anime. I don’t care that people enjoy this because hey everyone has different tastes but I do think it is a shame that something like this will get seen by so many more people than so many more worthwhile anime series. I love how one of the vignettes is just a redo of a Batman the animate series episode (the one where each kid describes seeing batman). Except that episode was good and from what I’ve heard of this, not so much. Whatever, that’s what netflix is for. @dengar: Rental is a good idea. If you’re a big fan of Batman you might like it a bit more than I did. I wonder if the Animatrix’s success has something to do with the Wachowski Brothers’ obvious admiration for anime in their work? Their world probably lends itself better to the pervading themes in anime, which in turn allowed for more imagination and substance when it came to anime types having a crack at it. The only major similarity I can draw between Batman and anime is the ‘atmosphere’, which is tenuous at best and generally a bit superficial. This is really too bad, I was so excited when I first saw it’s fluid animation and anime inspired designs; I’ve been wondering what such aesthetics could bring to Batman – it’s shame to hear it does so little. Still, sooner or later I’ll check for myself. Lots of people hated the animatrix but I found it to be largely decent (Second Renaissance stunned me, making up for the less imaginative episodes). Perhaps the directors were restricted by the Batman concept? Such a popular franchise may be difficult to expand on, too much expansion and imagination could contradict something and annoy western sponsers. At any rate, I feel really let down to hear it couldn’t take anything further than the moderate success of The Animatrix. To hell with substance, give me stupid, violent and extreme any day! Seriously, am I the only one who’s sold on the idea of stylish 10 to 12 minutes animated shorts alone? That’s already better than majority of anime we get every years! Still, you’re right it is wasted potential, but even if it achieved that said potential, I really wonder if it would have changed anything. @Hige: Some of the animation is beautiful, but some of it isn’t. Surprisingly, Production I.G’s contributions are rather poor in comparison to Madhouse and Studio 4C’s efforts, despite them having slightly more experience of theatrical anime with the likes of Ghost in the Shell. Also, I don’t think the Wachowski Brothers became anime fans after The Animatrix, rather I think they were rather huge fans before hand and pushed to produce it out of a desire to promote anime in the West. That’s probably why they managed to attract so many big names to direct too. In comparison, all the directors used for Gotham Knight were relative newbies, character designers and animation directors. @Wildcard: I know, I was disappointed too. I’m not so pig-headed to assume that you absolutely won’t enjoy it, and I guess a lot of it depends on whether or not you’re really excited about Batman as a character. As far as I’m concerned, it could of been so much better, and it’s fairly “decent”, but never approaches the quality of The Animatrix. @ThatQuebecGuy: If it was as good as the Animatrix, I think it could have done *something* to conceive, maybe, a couple more thousands anime fans, which is always a good thing. That this is finding its way into the hands of ‘non’ fans is quite important, so it’s just a shame that they couldn’t have produced something with a little more depth. Also, I know what you mean about scorning substance if it means being able to enjoy a great visual style, but something about this is inescapable empty, both in terms of style and substance, it just doesn’t ‘ring true’ in the way that something like “Comedy” or “Beyond” does, as if there’s a clinical disconnect between the show and any semblance of human emotion. Fansubs of Genius Party have just been released. Get them now, guys, it’s a proper anthology.